It can be hard to leave beautiful, bustling Sorrento, but there's even more beauty to be found along the Amalfi Coast with towns like Positano and Ravello. You can take a ferry, bus or drive along the coast. My friend and I ended up driving ourselves, but that may not be the choice for everyone. The tight, mountainous road with twists and turns every two seconds is not for the timid driver, but does allow you to pull over wherever and whenever you want. And you will want. It's only a 5 mile drive south from Sorrento to Positano, but I think we stopped 6 times on that drive. Not only are there wonderful pottery shops to poke into, but there are jaw dropping views around every turn. You're high atop dramatic cliffs that drop straight into the crystal blue water below. Of course there are beautiful little villages scattered throughout that add further color and dimension to the drive. You'll want to stop in all of them, but if you're planning on driving the Amalfi Coast in one day, you'll need to make some choices. 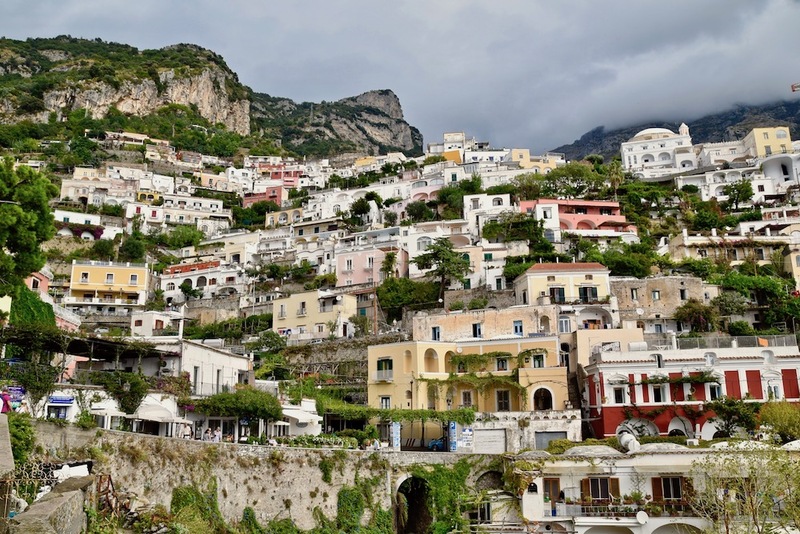 Positano is a must-see Italian town. You're first glimpse will come around one of the hairpin turns on the drive. Positano is built straight up from the water. The town is so vertical that when you're driving on top of it, you can't see anything but water. Parking can be difficult to come by, but dump the car when you get into town and set out on foot. With this vertical city, be prepared for some stairs. Many, many stairs. It can be hard to know where you're heading at times since you can't see much when you're climbing down, but you'll eventually hit the water. On one end of Positano is a quiet beach where you can rent umbrellas and chairs and enjoy the day. There's also a few cafes to grab a drink or casual bite. From there, climb the stairs at the southern end of the beach which connects to a path leading to the center of Positano. The colors of Positano pop off the side of the mountain. It reminded me of Cinque Terre with the collection of beautiful, brightly colored Italian towns jutting up from the water. Positano has a lot going on and could be worthy of a multi-day stay, but for now, there's more to see on the Amalfi Coast. There's an actual town called Amalfi 11 miles further south from Positano. It's a medieval city, complete with charming square, cobblestone streets and mosque-like cathedral. We had planned to stop there, but the traffic and lack of parking prevented us from making a visit. It turns out September is the new summer with tons of traffic and visitors. That is one reason a driver or the bus can be a better choice. We pressed on and headed for the hilltop town of Ravello. Ravello is a sleepy little village with sweeping views of the Amalfi Coast. Even though the rain had started when we arrived in Ravello, we still were able to enjoy some amazing panoramas. Ravello is a nice place to chill, enjoy a meal and a glass of wine. There's a decent sized square with a cathedral on one end and many cafes scattered across. Be sure to head further west from the Piazza Duomo, and yes climb more stairs, to explore the upper town. 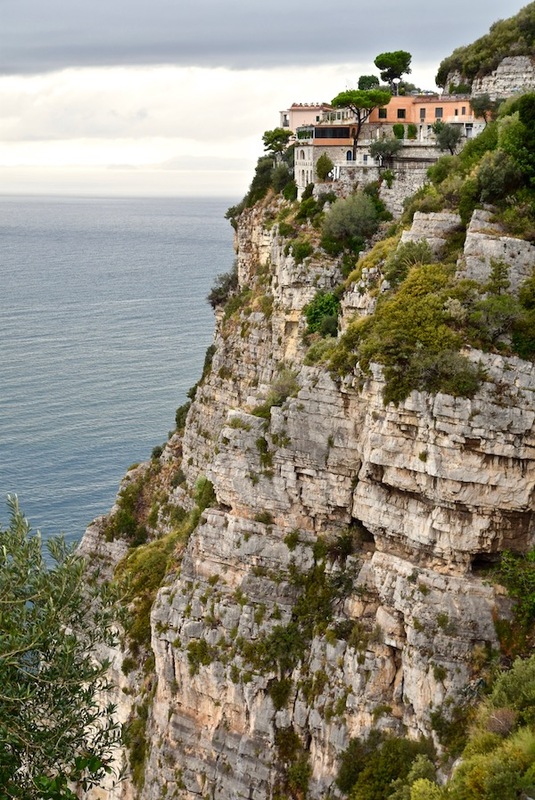 High end hotels sit up here, as well as the amazing Villa Cimbrone. The stunning gardens are 1500 feet up from the water and provide a quiet sanctuary to take in all the beauty that surrounds. If it hadn't been raining, I would have spent the entire day there! Villa Rufolo also contains some stunning gardens, as well as a villa to tour. One of the lower terraces often hosts the annual Ravello Music Festival. The Amalfi Coast offers eye candy for days with beautiful water and cliffside towns scattered about. You can spend days soaking it all in, but there's still more to discover. Next stop - the island of Ischia!